I wanted to bring everyone's attention to this article and situation in general that I've been hearing non-stop about over the past few days. My dad listen to news radio 24/7 so I've been getting fed spoonfuls of this man's negativity (they've been talking about him nonstop.) Terry Jones, a pastor from South Florida, is basically really pissed off over the new Mosque that's being built in N.Y. Now he wants to take it to the next step and declare this upcoming 9/11 as "Burn a Koran Day." I usually try to keep my blog clean (so it's appropriate for all ages) but WTF is wrong with this man?! I have my own personal beliefs (I'm Catholic and believe in God) and believe that everyone has the right to believe in what they believe in whether they're Christian, Catholic, Muslim, Jewish, etc. or believe in meditating and crystals that carry energy It is completely immoral to burn someone's "holy book" or something that is so sacred to them -it's like if someone were to take my bible and rosary and burn it in front of me. Never mind the fact that this is very wrong, this could put our own troops in danger. Geez.. I thought everyone could use a little peace by now but this man seems like he's just trying to stir up trouble. It's pigs like this who F up things and make them a lot worse than they have to be. As for the Mosque that's being built in New York, I'm for it. It's like telling people that it's "evil" and "wrong" to have a church or temple where they can go to worship and feel safe. I think any holy place should feel safe and uplifting -not negative and wrong. Also, I am 100% positive that at least 1 person who was killed or hurt because of 9/11 or the aftermath following the terrible day was Muslim. Do you know how many Muslims there are in the world? A LOT. There are going to be Christians who are evil but there will be more that are kind and moral just as the same has to do with people of every religion and belief. So no, I don't find this mosque disrespectful at all. This man needs to be stopped and I pray that he doesn't go through with what his delusional mind deems as appropriate. UPDATE: Terry Jones has decided to cancel "Qur'an burning" on 9/11. He supposedly decided to cancel this because he was "promised that the mosque would be moved." It isn't clear whether the site of the new mosque has been moved or not (I don't think it has.) I don't know if I believe what he's saying. He's been pressured by so many, including President Obama, to not go through with his plans for 9/11 so I think.. maybe he just chickened out?? Either way, I'm glad he's decided not to go through with this and I'm still crossing my fingers that he doesn't do anything drastic last minute on the day of. And for those who wanted some uplifting, heart warming news (I could use some after that)..
Dwight Howard, one of my favorite guys in the NBA, granted a dying woman her only wish -to have a conversation with her hero. Kay Kellogg is a die hard Orlando fan and this was her only wish. 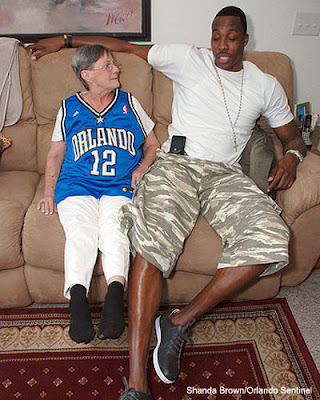 She said, "Dwight Howard is just such a precious, wonderful kid. Whenever I watch him play, he just makes me feel good inside." That's actually exactly how I feel about Dwight too. He just seems like a really good guy and carries himself in a nice (sometimes really goofy) manner. I respect players that act and behave down to earth like normal people and do nice things for others. It just makes them 100% more likeable. Anyways, Dwight surprised her with a visit and they ended up spending 2 hours with her (instead of the planned 30 minutes.) I just thought it was really kind that he took time out of his day -especially when he really didn't have to. It was on his own free will. I mean, how psyched would you be to have your only wish come true?! My little cousin, who passed away this year, made a "wish" to meet Miley Cyrus before her time came. Make A Wish granted it for her and she got to go to the concert and meet Miley afterwards. They also came through for my friend's younger brother (before he passed away) years back and granted him a family trip to Disney World. These stories are always so heart warming and make you so much more grateful for who and what you have in your life. 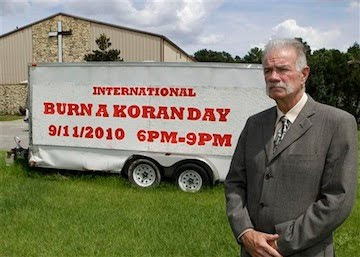 Ugh, Terry Jones and anybody else who thinks Burn a Koran Day is okay make me so sick. My insides feel like they're bubbling up with rage anytime I see this mentioned. I appreciate your uplifting news section at the end though lol Brought a happy tear to my eye. You know, after reading the story about Terry Jones, I was ready to break something in anger. I was angry that someone who represents their religion and church would do such a hateful and hurtful thing. While yes, the actions of the 9/11 attackers were wrong, punishing an entire religion for such actions is really stupid. It's like punishing all Christians because of the Crusades. My point is this. I was extremely angry after reading that story, and then I did a complete 180 with the Dwight Howard story. I just started crying because it was so heartwarming. For every stupid story I read it feels nice knowing that there is someone out there counteracting all the bad things by just being nice and helping another person out. @ Pamela.. I loved the story too. @ Andi.. That's exactly how I feel. I can't understand how a PASTOR would think this is right!? I'm totally on the same page as you -why punish an entire religion and innocent people. I cried a little too after reading the 2nd story. It was just such a kind, "small" gesture that really changed her life. I enjoyed reading this post...thanks for the update on Pastor Jones...I had no idea he changed his mind. Thanks for sharing the heartwarming stories at the end. I'm so glad those wishes could be granted in time. This is a wrong decision it's our holy book, every person should respect every other religion and please not every muslim is extremist even muslim countries are facing problems because of some bad people take my country(Pakistan) it is our holy month Ramdan but still there were bomb attacks in last 4 days and more than 120 people died so please don't punish all muslims not everyone is bad there are a lot of people with moderate views. Thanks God they have decided to cancel this whole burning Quran programme otherwise it would have created a lot of anger in all muslims,thaks to president obama. I am so happy to read that you are against this decision and that the mosque should be built .Muslims pray 5 times a day so if there are mosques in different areas it makes easier for them to offer their prayers . Ugh I'm so sorry you have to hear this terrible news during Ramadan. I'm so sorry to hear about the 120 people who died. It seems like every day, you read about someone dying and it's just really depressing. I believe that everyone should have a place where they can just feel safe and pray -it's really not much to ask for. People just need to leave it be. And I'm so with you! God bless all those kind hearts in the world.